© ENC Press 2018. Tipping sacred cows since 2003 The covers of the books you receive may differ very slightly from those pictured here. We publish for the reader who wants to read our books. 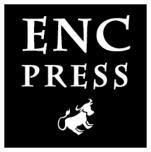 Since 2003, ENC Press has been seeking out and publishing irreverent, genre-busting fiction that has elements of social and political commentary, offers insider’s insights into foreign cultures, and tips more than a few sacred cows along the way. Regardless of their commercial potential or lack thereof, we promote and keep in print authors whose ideas challenge the mainstream audience to look beyond the simplistic and the mindlessly polarizing. 15 years in business. All titles still in print. Dare you browse our catalogue? Yes? Ya think? Then click here. We publish for the reader who wants to read our books. Since 2003, ENC Press has been seeking out and publishing irreverent, genre-busting fiction that has elements of social and political commentary, offers insider’s insights into foreign cultures, and tips more than a few sacred cows along the way. Regardless of their commercial potential or lack thereof, we promote and keep in print authors whose ideas challenge the mainstream audience to look beyond the simplistic and the mindlessly polarizing. Dare you browse our catalogue? Click here. © ENC Press 2018. Tipping sacred cows since 2003. Covers may vary slightly from the ones pictured here.